We usually associate strength, endurance and the likes with fitness. But there’s so much more to it than just raw, brute force. Flexibility and mobility, two vital keys to being fitter are often overlooked. We tend to keep them last on our priority list, when it comes to working out. We all think we’re iron clad. We also tend to equate the terms; flexibility and mobility; often using them interchangeably. But in truth, they are distinctive concepts and affect your fitness differently. Truth be told, this isn’t just limited to the frequent gym goers. Beyond your training sessions, both these tools promote joint health. If you lack general mobility, it’s going to affect your everyday movements. It’s a clear indication that your body isn’t performing the way it should be.Initially it’ll surface as discomfort or pain. Eventually, your internals will give away, succumbing to wear and tear. As for those who workout regularly, training those immobile areas with greater intensity is only a call for trouble. You’re placing added stress on those parts, which could mean a potentially painful injury. Our muscles work in synchronization to move a joint. One stretches, while the other shortens to allow movement. Even if one of these muscles are tight, balance at the joint is thrown off. This translates to poor form, inadequate range of motion, muscle weakness and eventually injury. That’s where mobility comes in, just like your knight in shining armor. It has to do with strength in the right positions. Mobility exercises help workout the kinks in your body. They are aimed at improving your range of motion while performing a movement, eliminating restrictions and improving proficiency. The better your mobility, the better your form and the more the room for improvement in both the strength and endurance domains. There is a common misconception that inflexibility can’t be altered. In truth, if you could teach your body to lift weight or run distances, you can teach it to be flexible. Most people have sedentary day jobs, which require them to sit in front of a computer screen for hours. You may think that’s harmless but it’s not. Your body was built to be mobile. Long hours in a seated position will tighten your hips, core and legs. Your muscles will shorten and your posture will worsen. More of a reason for you to include mobility work into your daily training regimen. Most commonly the areas that trouble us the most are the back, shoulders and knees. Here’s what you can do to alleviate your grievances. Foam Roll: Release tight spots in the muscles. Stretch: Before and after your workout. Mobility Drills: These specific exercises will help with your range of motion. Often we blame soreness on the lack of stretching. Have you ever thought it could be more than that? When a muscle is pushed to do more than it can, it will result in strains and consequently decreased mobility. You’ve got to teach it to relax, rather than going for the overkill. Now I’m not saying spend an added hour at the gym mobilizing and stretching. Most of us don’t have the time or the patience. The best method is probably to work the areas you know are tight, or those which have troubled you in the past. Thanks for the information. 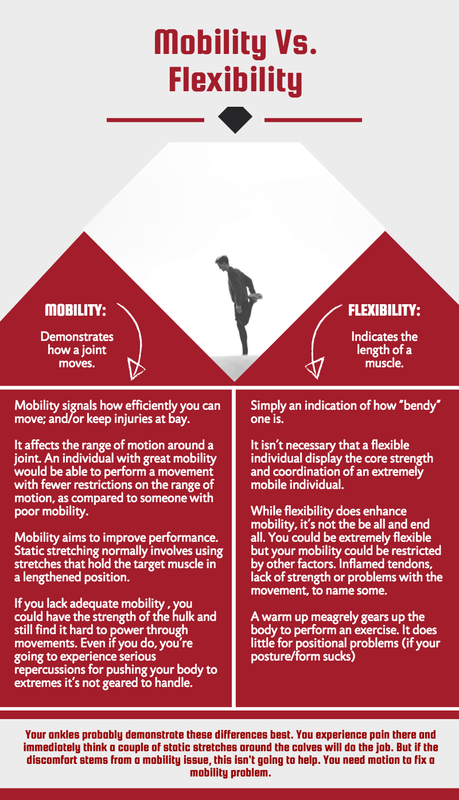 I love that you have a great understanding of mobility and its importance in everyday life.